Sensational 2017 Bando x Kodo Collaboration “Yugen'” Returns Reimagined as a New Kabuki Production Accompanied by Kodo! In 2017, Kodo joined Kabuki luminary Tamasaburo Bando on stage for an inventive collaborative work, Tamasaburo Bando x Kodo Special Performance “Yugen.” This original production provided Kodo with a truly unique challenge: to use taiko to conjure the subtle yet profound world of Noh Theater with Bando. The combination of Bando’s unparalleled elegant dancing prowess and Kodo’s innovative musical accompaniment in Yugen, which means “subtle grace,” garnered great acclaim throughout its sell-out premiere season in Japan. This year, “Yugen” will undergo a renaissance, transforming into a new Kabuki production with the same title. 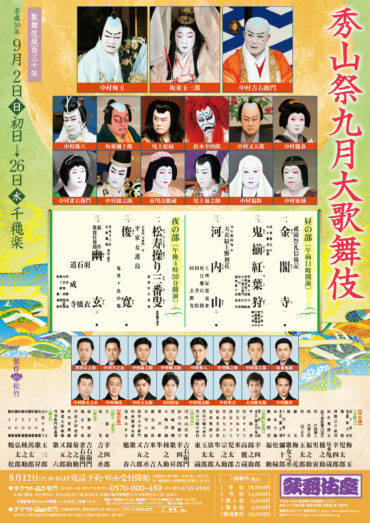 The new-look Yugen, also starring Tamasaburo Bando, will be presented each day as the final act of the evening show during the upcoming Kabukiza Theatre September Kabuki Performances. In the latest reincarnation, Bando and a cast of Kabuki actors will be accompanied by Kodo, who will perform the ingenious music they honed throughout 2017 season of the original collaboration. Based on the iconic works “Hagoromo” (The Feather Robe), “Dojoji” (Dojo-ji Temple), and “Shakkyo” (The Stone Bridge), “Yugen” promises to take audiences on a journey to new horizons of expression and imagination; to a creative realm where captivating dance, Kodo’s soul-stirring taiko, and exquisite music inspired by the world of Noh, all meld into one. *To read the stories of “Hagoromo,” “Dojoji” (Dojo-ji Temple), and “Shakkyo” in English, please visit the Shochiku Kabuki Official Website. *Note: Kodo will perform the music for this new Kabuki production. The Sep. 9 Evening Show is a private performance. Ticket sales commence on Aug. 12 (Sun) at 10:00 by telephone and online. ※Tickets will be available from the box office counter from Aug. 14 (Tue) at 10:00. ※Tickets will not be kept for box office sales and will be subject to availability. ※Please take care when dialling to avoid calling the wrong number. Please use the redial button if calling multiple times. Detailed access information in English is available here.